Building a dock is particularly useful for those with waterfront property, or has access to boats. It is built over the surface of water for various purposes, depending on owner’s preference and budget. Building this structure requires some expertise and if you are a novice builder, this task is best left to the more experienced. However, if you feel that you are confident in taking up the challenge of this project, why not continue reading and discover some methods on how to build a dock. The size and layout of your dock depends on the available area for construction and suitability of land structure. A more general use for this area is to get on and off boats. Other common uses include fishing, sunbathing, dining and lounging. The commonly used material for building this structure is wood. Nevertheless, another likely option is aluminum. Both materials have their advantages and disadvantages, and most significantly is the difference in price. Explore the available building material options before you make your decision. Generally, there are two layouts frequently used by builders. One involves a long and narrow section where you can easily get on and off boats, while the other involves an extra section where you can have a wider space to dine or lounge. You need to know how far you want the narrow section to be. That literally means how far you need to walk from land to access your boat, or vice versa. To build the frame for narrow section using wood, you will need approximately three pieces of 12-foot long boards, and a 4-foot long board to be attached to all three boards. Then, attach floor boards on top of the frame. For the larger section, feel free to create a frame that suits you need best. Decide whether you prefer a floating dock or one that is anchored to the land beneath the waters. This depends on whether the soil beneath is firm or loose. To create a floating structure, simply insert Styrofoam between frame and floor boards. Having a post anchored to ground will give your structure added stability. To connect the two sections, use steel rods and eye bolts. Bear in mind that the whole structure should be able to move with the flow of water and wave. Last but not least, you may add foam material or rubber tires to help boats bump gently on the dock. Ensure that the structure is safe for use before allowing anyone to access it. With these simple guidelines, you now have a general idea on how to build a dock. 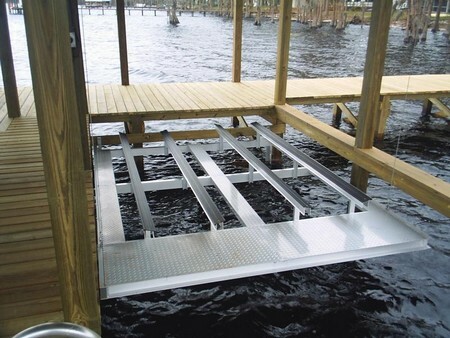 Most importantly, ensure that personal safety should be top priority when using the dock.